1. It's entirely from a commercial pattern - fitting dresses from commercial patterns is why I learnt to draft my own. 2. Spotting the pattern and fabric to finished dress took about 3 weeks. This is unheard of for me! 3. It turned out really well! Let's take point 2 first. The inspiration came from two lovely ladies - the fabric from Roisin from Dolly Clackett when she posted it on Instagram; and then, on the same day, Sarah from Sew Sarah Smith posted the pattern on Instagram. The fabric is some Liberty Cotton Lawn called Paper Roses, and the pattern is McCall's 7116. And because I have absolutely no willpower, I ordered both on ebay at lunchtime. Version B with the Peasant Top bodice really caught my eye, as that's a style I love. I've tried to find out how to draft a peasant top, but without much success, so this dress came up trumps. I'm looking forward to getting my paws on Gertie's Peasant Blouse pattern when it is released. This leads me onto point 1. I thought it would be worth trying out the pattern, as the shoulders and bust are a loose fit with the elastic in the neckline. This is the area where I struggle with fitting dresses and tops. And I thought if the skirt didn't fit, I could then mash the bodice with my block. A read through the pattern instructions provided me with a lightbulb moment. I've tried to draft this style of skirt before, but could only make it work by using darts to shape the middle and hips. This skirt is cut on the bias, and that made all kinds of sense when I saw it on the fabric layout. A toile was made, and unbelievably, it fitted! The bias skirt, and loose bodice are obviously very forgiving. I ended up making most of my dress in one day. I used French Seams throughout, except for the zip seam, which I stabilised with a strip of lightweight interfacing. These was no mention of stay stitching in the instructions, which made me very nervous, given all that bias cutting, so I stay stitched pretty much everything! The elastic on the sleeves gave me a bit of trouble. The instructions say to use 4" of elastic, which is inserted into the hem at the centre front of the sleeve. Now, it might just have been the elastic that I was using, but I just couldn't get it to stretch been the pattern marks. So I used 6" of elastic. That didn't work either, as then the sleeves were too loose. So I unpicked it, and put elastic around all of the sleeve hem. On the other hand, the recommended amount of elastic at the neck was too much! Luckily I worked this out on the toile. Also, I didn't love how the neckline was constructed, so did it differently. The instructions have you press the neck edge in by 1/4" then again by 3/8". This is then stitched in place leaving a gap to insert the elastic. Doing this on the toile nearly killed me!! It was tricky to keep the measurements accurate when pressing, whilst also trying not to burn my fingers; and then feeding in the elastic with a safety pin was the stuff of nightmares... 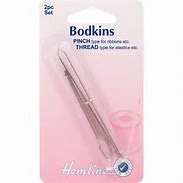 I've since discovered these little bodkins for doing this, so ordered some on ebay, but haven't tried them out yet. Here's how I did the neckline and sleeve hems on my dress. As this fabric is cotton lawn, so very lightweight, I made some 1/2" bias tape with it - I think I made about 70" for the neckline, and that was plenty. I sewed it on as if facing a neckline or armhole, and trimmed off the seam allowance. Then I pressed it over onto the wrong side of the dress, and stitched it in place, leaving a gap to insert the elastic. It worked like a charm! I used an invisible zip because it was the only zip I had that was a good match. This meant I had to change the construction slightly, and I assembled the whole body of the dress, attached the zip, then sewed on the sleeves. Because the skirt is cut on the bias, I left it hang for a while on my dress form before hemming, but it didn't seem to stretch. I'm delighted with how this turned out, and now have a few hacking ideas. I'm hoping to made a colour block dress with elbow length sleeves, and an A-line skirt, as inspired by these beauties from Coco Fennell. I've already toiled the sleeve, and it worked perfectly! These next photos were taken a few days ago when I was on my holidays in Simon's Cove in County Cork. We stayed in an old cottage right beside the sea, and made friends with a little stray cat who we called Simon. He was really friendly, but a bit skinny, so we gave him plenty of cat food. 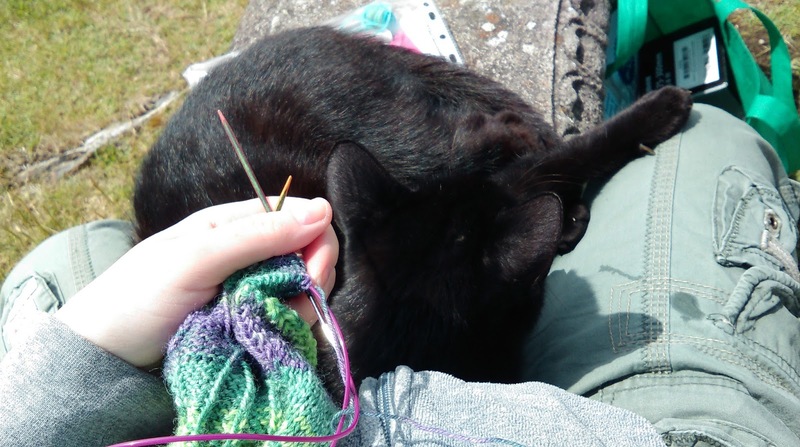 You can see that Cork is even more windy that my usual photo spot outside the back door of my house, and when I was trying to do some knitting, Simon decided I needed to be scratching his head! Thank you! Ebay is just far too convenient for buy fabric (and other sewing supplies too)! Very nice dress. Beautifully made. Such a lovely dress! The fabric is to diiiiiie for! Thanks Melody, it's it fab?! Thanks Sarah! I'm really please with how the neckline turned out. I love this print, it's sweet without giving a toothache ;o) You picked a great pattern for it. Thanks Colette! I love the wee scissors and you sort of have to look at it to see them. Love the dress! Love the technique for the elastic. I have learned so much from you! My favourite thing is to under stitch inseam pockets! Every time I make pockets I think of you and smile in gratitude! Thanks Lori! Honestly, doing the elastic the way I did was so much easier than the pattern instructions. I love an understitched pocket, it really makes a different to the way it sits. I'm currently making a raincoat, and last night I understitched the edge of the lining to the facing. It wasn't in the instructions, but seems odd to not do it! I love how the bodice fits, it's really pretty with all the gathering. Glad you had a nice break with your adopted cat! Thanks Helen! I thought of Flo when I saw that little cat, and I wished I could have brought him home! 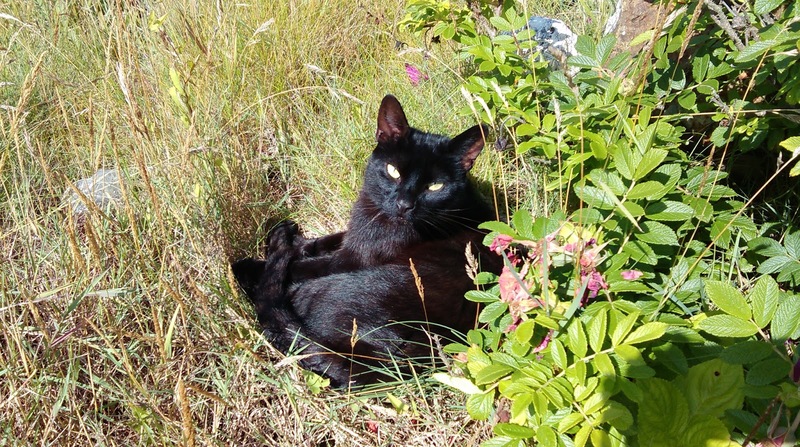 Aw, sweet cat! He definitely distracted me from your dress for a minute :) It turned out so lovely, though, the drape on the skirt is wonderful! Thanks Kelly! I love how the skirt sits, and I don't think I've made a bias cut skirt before. Beautiful fabric (I think I have 3 meters of it from ebay too! we must shop from the same woman :) ) and I love the pattern you used it to make. Thank you for that heads up on applying elastic around the neck (this would work for around the wrist too) - great inspiration thank you! Thanks Kathleen! We obviously both have great taste in fabric! Good luck with whatever you make with yours. Great dress Lynne - it's a really pretty shape! I have a dress made out of the pink colourway of that print (but on a poplin) that really deserves to be worn more! Thanks Ruth! I didn't know this print was also in poplin - and off I go to investigate! I've also made this dress, in the same view, and love it too. I'm thinking of making one in white, as a top. I found it easier to fit too - hooray! Looks great on you! Thanks Jennifer! I hadn't thought of making it as a top, what a great idea! Good luck with yours. Love the pattern, it's a beautiful fit (...I ordered it from Ebay before I finished reading your blog!). I'll definitely be following your neckline advice. Btw, do you happen to know of any good evening sewing classes in Belfast besides the one in BMC. 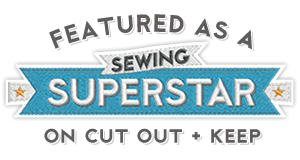 I'd really like to find a class that's not a sew-along style, catering for advanced beginners. Any suggestions would be gratefully received. Thanks Julie! Always happy to enable! Re sewing classes in Belfast, unfortunately I don't know of any evening classes. Funnily enough I had contacted a lady called Lizzie Agnew last week about a coat making class (here's her website - http://www.lizzieagnew.co.uk/schoolofdressmaking/), but she said she won't be doing any classes until next year. I did an pattern drafting class with a lady called Pat Dickson a couple of years ago - here's my post about it http://ozzyblackbeard.blogspot.co.uk/2015/07/pattern-drafting-class.html. But her website isn't working now, so I don't know if she's still doing classes. I did my class in Studio Souk which is now in Ann Street, so maybe they would have more info. 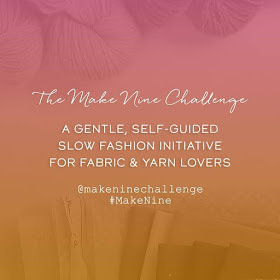 I know there is a lady in east Belfast called Christine Boyle (here's her website - https://www.colourandcloth.com/), but I haven't been to any of her classes. That said, I see she has a class on using an Overlocker, so I think I'll contact her about that! Julie, if you haven’t already been in touch, Christine at colour and cloth is fantastic; I can’t recommend her classes highly enough. I attended her overlocker class in jan 2017 and then an intermediate class from March to May. I had planned to take the advanced class this March but work is too hectic currently. Such a pretty dress. I just love a peasant top and I love even more how it works beautifully with an empire line dress like this. Fits you beautifully! Beautiful dress. I am making the same pattern currently but using view D , hence I found your review and my late comment . Hope you have got to wear and enjoy your dress before the col weather hits. Thanks Janine! I've got to wear my dress a few times, but it's too cold for it now. Good luck with yours!